Is One Electrical Safety Switch Enough In Your Home? Have you seen the Electrical Safety Office ads currently running on TV and radio at the moment? At Unified Electrical we take electrical safety in the home extremely seriously and we’re happy to support this campaign and spread the message: The risk is real. One electrical safety switch may not be enough. 29 people have died in Queensland through electrocution since July 2009. That’s 29 too many people and there is no reason for these accidents to keep happening. Safety switches save lives. Many people mistakenly believe that if they have a safety switch installed on any circuit in the home they are fully protected. In fact, the life-saving devices are missing from more than a third of Australian homes and of those that do have them, the vast majority do not have them on all the necessary circuits. A safety switch only protects you if it is on that circuit. Many people also confuse a safety switch and a circuit breaker. So what’s the difference between an electrical safety switch and a circuit breaker? Put simply an electrical safety switch or Residual Current Device (RCD) is designed specifically to prevent electrocution of a person whereas a circuit breaker are designed to protect circuit wiring and appliances. Safety switches shut off the electrical supply in a fraction of a second when a current leakage is detected, avoiding the potential for serious electric shock, burns or worse. In fact, an RCD can disconnect the circuit within 300 milliseconds! Circuit breakers, on the other hand, are designed to protect a circuit from overloading or short-circuit. You can usually recognise a safety switch by the ‘T’ or “Test’ button on the front and this can distinguish it from a circuit breaker which may look similar. In Queensland there are a number of legal requirements in place to try and ensure homes are protected including that all rental or sale properties have to have safety switches installed on power point circuits. Further details of legal obligations can be found on the Electrical Safety Office website. Ensuring your family is adequately protected in the home should be the number one priority. After all, accidents do happen and the benefits and protection afforded by such an amazing piece of technology far outweigh cost of installation. You should consider having a safety switch installed on every circuit in your home including lights, powerpoints, air conditioning, pool equipment, kitchen appliances and hot water. 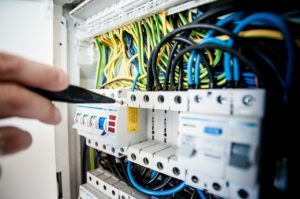 If you would like to get a quote from our qualified electricians in Brisbane to ensure safety switches are installed on all the circuits in your home, give us a call on 0414 751 299. Or why not take advantage of our Free Electrical Safety Inspection. Our friendly, licensed Brisbane electricians will go through your property, identify any obvious electrical problems and offer honest, qualified advice on what needs to be resolved and how urgently it needs doing.